There is a choice of shared or private accommodation. Fees are per person, based on your choice of accommodation (as listed below). 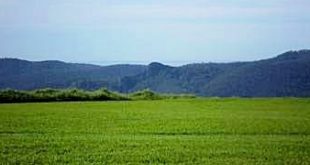 Choose from a selection of homestay accommodation within the beautiful Queenslander, with stunning views. In the sanctuary tradition of retreat-style housing, the accommodation supports your program experience. It is simple, beautiful, clean, homely, sparce yet comfortable, and without distractions. It provides you with both the space and peace you are seeking. The retreat is totally non-smoking, alcohol-free and vegetarian. There are 14 bedrooms, some single, some twin-share. There is space for gathering together as well as areas to get away if you want privacy. The accommodation reflects the per person rate and includes all your delicious, home-cooked, vegetarian meals, program and activities. There are no refunds for unused parts of the program or meals. EVERY ROOM is fully furnished, carpeted, and provides country amenities and comfort, with insect screens, comfortable single beds made up with an electric blanket, sheets, doona, pillow and cushions, a reading light, hairdryer, towels, room fan (per room) to operate as needed, torch, hot water bottle, bath mat and wash basin. Extra blankets are also available if necessary. All bedrooms have views. Bathrooms have complimentary biodegradable shampoo, conditioner and hand and body wash for your use. 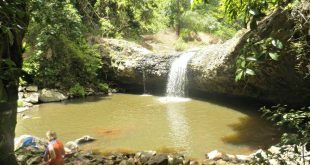 There is a casual, loose and relaxed, but definite STRUCTURE in the programmed life at Nirvana Wellness Sanctuary. Your personal space is for you to sleep in and park your possessions. There are no maids cleaning up after you or making your bed. You won’t need your handbag, high heeled shoes, or to ‘dress up’ for a retreat, but at the same time, you won’t be in your PJs all day. MEDITATION RETREATS have a higher level of structure. Layers of belief, conclusions, ideas, habits, attachments and fears are the prison walls constructed from the bricks of approval, applause, fame, acceptance, success, power, popularity, self-promotion, and so on. What joy is there if you ‘gain’ the whole world and forfeit your life? When we find that these worldly feelings lead to an empty, shallow life we must challenge stereotypical ideas and beliefs and the status quo. We must move you away from thrills, spills, excitement and self-glorification. Self fulfilment is a spiritual feeling. All are blessed and nourished. PARTICIPATION: Whilst you are welcome to participate in as little or as much as you want to, you will find that the fundamentals of Nirvana’s program – meditation, gentle yoga, deep relaxation – will be extremely beneficial for you. Many people who attend tell us that they are overscheduled in their daily lives, which is why they need some structure for work-life balance in their lives. 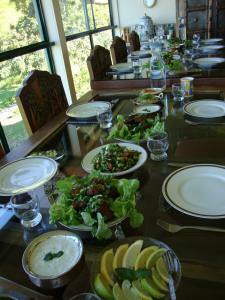 MEALS Retreats are a time to unwind, eat delicious healthy meals from a fixed menu, which are cooked fresh, daily, for the number of people present, and are eaten communally. Whilst there is plenty to eat, and you won’t go hungry, so that we can include some enjoyable food such as desserts or foods that are rich, parts of the meal can be portion controlled. There are no short order cooks. Special menus need to be negotiated prior to the retreat booking, and can incur an additional fee. WIRELESS INTERNET access is free, and we do request that laptops and mobiles be used in consideration and in bedrooms. Whilst we encourage you to remove your watch, and shoes (no outdoor footwear is worn indoors), and ditch your mobile phone, we live in the same world as you do, and understand that the digital world we live in has changed the working life for many people. Thus, yes, there is internet access at retreat. Please feel free to bring your laptop so you can access work, or the world, if you need to. Having said that, please understand that a retreat is not a resort. Please come prepared to respect what is on offer. 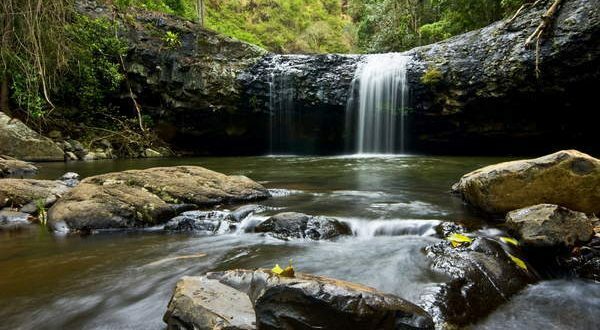 Also included is a variety of informative, engaging, inspirational and communal DAILY ACTIVITIES including gentle yoga, yoga breathwork pranayama, meditation and mindfulness, deep relaxation yoga nidra, spiritual talks, discussions, mindful art, nature walks and hikes, evening programs and extraordinary views – all in the natural beauty of the Gold Coast hinterland. Below you will find descriptions of different lodging options. Please don’t hesitate to call or write with questions or for further clarification…that’s what we’re here for. Weekend getaways are time-out breaks, which start with a delicious dinner on a Friday evening after dusk, and ends on Sunday afternoon, after lunch. 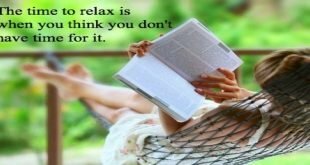 They allow the participant to unplug, unwind, eat well, move well and chill out. If you are attending by yourself, you need not feel like you are by yourself. 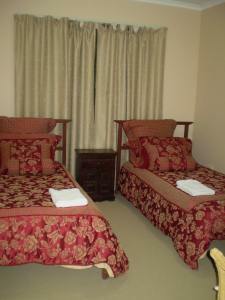 Twin share rooms provide an opportunity to meet people. They allow for two people per room and have nearby bathrooms. We have found that people have made great friends when opting to share space and room with others. We are happy to take a twin share booking for you. You can attend with someone of your own choice, or we will aim to pair you with a same gender participant who would also like twin-share accommodation, and advise you to please book early. However, we cannot guarantee this, and if there is no one to share with you, a single room rate will apply by choice or circumstance. – Where no suitable companion is available, single room rate applies. – Twin share is two beds in the room, not a double bed. These simple, peaceful rooms are a great mid-range option. They include a single bed, with shared facilities in the bathrooms nearby. Single room rates apply by choice or circumstance. These quiet, private rooms are perfect for those who want a real retreat and include simple comfortable décor, a single bed and private amenities. Inch loss treatment $120 per session or $70 add-on treatment. Cells and tissues in the body change over the years. Nirvana’s rejuvenation program will help refresh and rejuvenate your body’s systems and provide the body, mind and spirit balance. Rejuvenating body treatments with medicinal oil, rejuvenating face masks and herbal medicines are part of this package. Treatments daily for 60-90 minutes. Recommended for 14 days. Our eating habits, lifestyle and environmental conditions can cause toxins to accumulate in the body and result in an imbalance of the tridoshas (the body’s functional aspects). Nirvana’s body purification therapy supports the body’s natural mechanism of excreting these toxins and purifying the whole body so that it regains its natural balance of Vata, Pitta and Kapha. The 10-day package is based on panchakarma (purification processes in the narrow sense) and includes herbal medicines, dietary tissue cleansing that results in purgation, various oil applications (snehanakarma) and sweat treatment (swedanakarma). Detox: Add $100/day or $500/week. Program $210/day or part of a day. Meals are extra for non-resident visitors: Breakfast: $45. Lunch (main meal) $55. Light Supper Dinner $25. 10am-1pm daily (Spring Retreat) $150 per session of 3 hours. This is the student concession rate. Please inform kitchen if you are intending to stay for lunch. Student rate of $25 applies for lunch. Retreat fees are non-refundable within fifteen (15) days prior to the scheduled event. There will be no refunds given for unused portions of program. There will be no cancellations accepted or refunds given on or after the event start date.